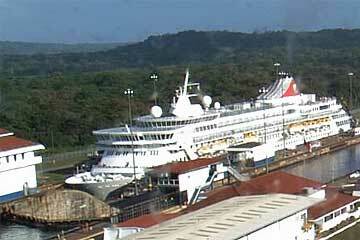 Balmoral is a cruise ship owned and operated by Fred. Olsen Cruise Lines. 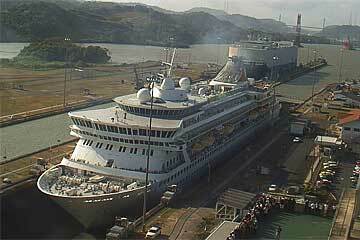 She was built in 1988 by the Meyer Werft shipyard in Papenburg, West Germany as Crown Odyssey for Royal Cruise Line. In 2007–2008 she was lengthened by 30 m (98 ft) at the Blohm + Voss shipyard in Hamburg, prior to entering service with her current operator. 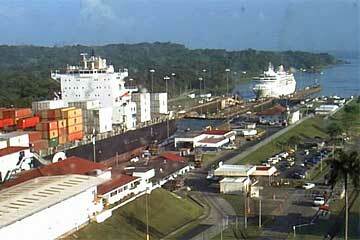 Here the Balmoral is shown on her South Bound Panama Canal Transit on January 22 2010. Carrying 1350 passengers (Standard Occupancy) the Balmoral offers 710 elegant comfortable cabins, world-class cuisine and diverse onboard activities.